Who invented the Umbrella? The history of the umbrella dates back to antiquity over 3500 years ago and such a device, in the form of umbrellas or parasols, was used by the Ancient Chinese, the Ancient Egyptians, the Greeks, Romans and the Mesopotamians. Who invented Collapsible Umbrella? However the name of the person credited with inventing the world's first successfully collapsible umbrella frame is Samuel Fox (1815 - 1887). Samuel Fox is not only famous as the English inventor of the modern Umbrella but also as a manufacturer and philanthropist. When was the Umbrella invented? Samuel Fox invented the Umbrella in 1851, during the Second US Industrial Revolution / Victorian period of invention (1850 - 1914). Definition of the Umbrella: The Umbrella is defined as a small, lightweight, handheld, collapsible canopy for sheltering a person from rain or snow or the rays of the sun (parasol) when opened. The umbrella consists of a collapsible, hinged metal frame mounted on a central rod that is covered with a round canopy of fabric material that is held by a crook shaped handle and opened by pressing a spring. Fact 1: Who invented the Umbrella? 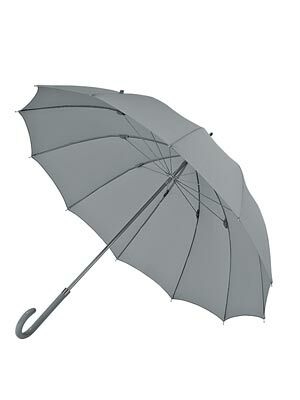 The Umbrella was invented by Samuel Fox in 1851 during the Second US Industrial Revolution era of inventions (1850 - 1914). Fact 2: Who invented the Umbrella? Prior to Samuel Fox's invention of the first successfully collapsible umbrella frame in 1851, the umbrella or parasol was used in China, Egypt, Rome, Greece and Mesopotamia. Fact 3: Who invented the Umbrella? The word umbrella derives from the Latin word 'umbra' which in turn derives from the Ancient Greek word 'ombros', meaning “shade” or “shadow”. Fact 4: Who invented the Umbrella? A general description of an umbrella is a "hand-held portable canopy which opens and folds". The device is used as a sunshade, or parasol, or as a portable shelter from rain. Fact 5: Who invented the Umbrella? The Chinese use of the umbrella and parasol dates way back to the 11th century BC where costly silk umbrellas with bamboo or mulberry frames started being used by Ancient Chinese nobility and royalty. The delicate silk top was beautifully painted with various designs of flowers, dragons, animals, figures, and writings. The most expensive also had beautiful carvings in the bamboo or mulberry frames. Fact 6: Who invented the Umbrella? Important dignitaries carried umbrellas and parasols with different shapes and decorations marking status and rank. Chinese members of the royal court carried only red or yellow umbrellas, whereas lesser mortals were restricted to blue umbrellas. Umbrellas were used for both ceremonial and practical purposes. Fact 7: Who invented the Umbrella? As a further sign of power and status the most important Chinese courtiers carried multi-tiered umbrellas, and the Chinese Emperor was protected with four tiers of a highly elaborate parasol. Fact 8: Who invented the Umbrella? The Chinese tradition of carrying umbrellas or parasols spread to the neighbouring countries such as Japan, Korea, Siam and Burma. In Siam, now known as Thailand, and Burma parasols with between eight to 24 tiers were used to indicate status and power. Fact 9: Who invented the Umbrella? Paper was invented in China in 105 AD and one of its uses was to be used for brightly decorated sun shading parasols. This brought down the cost of expensive silk shades and their popularity grew. Oiled , waterproof umbrellas were made using cheap cotton or linen that were oiled with teak oil and dyed with a coloring pigment - valuable time was not spent on hand painted decorations. Fact 10: Who invented the Umbrella? The people who lived in the land known as Mesopotamia, including the Sumerians, the Assyrians, the Babylonians and the Persians, lived in hot, dry climates and used umbrella devices as sunshades. It is probable that the first such devices were made from palm leaves attached to a stick. Fact 11: Who invented the Umbrella? However, the palm tree was sacred in Mesopotamian religions and as the objects gradually evolved only religious leaders, royalty and nobles were allowed to use them as a form of protection. The umbrella soon became a symbol of an important rank and wealth. Fact 12: Who invented the Umbrella? The umbrella was adopted by other cultures who had contact with the Ancient Mesopotamians and slaves in Ancient Egypt, Greece, Rome carried sunshades for their masters to shield them from the sun. In both Greece and Rome only the women used the protective shade of an umbrella, men viewed their use as 'unmanly'. Fact 13: Who invented the Umbrella? Because of the dry climates of the Middle East, Egypt, Greece and Rome the inhabitants never found a need to waterproof their parasols and create umbrellas. There is no evidence of the early use of umbrellas in the wetter climates of Northern Europe. The influence of the Roman Catholic Church also impacted the use of such objects as they were closely associated with the cultures and religions of Pagan societies. Fact 14: Who invented the Umbrella? Trade between the East and West during the Renaissance era witnessed the fashion for oriental goods. In the late 16th and 17th century France, Italy, England and America royalty and the nobility adopted expensive silk umbrellas as sun shades. Fact 15: Who invented the Umbrella? The umbrella that provided lasting protection from rain became an acceptable accessory in Northern Europe and America during the early 1800's of the Industrial Revolution when heavier and more reinforced umbrellas began to be manufactured and advertised. One such entrepreneur was an Englishman called Samuel Fox who invented the world's first successfully collapsible umbrella frame. Fact 16: Who invented the Umbrella? The inventor of the Umbrella, Samuel Fox, was born on 17 June 1815 in Bradwell, Derbyshire, UK and died on 25 February 1887. Fact 17: Who invented the Umbrella? Samuel Fox was apprenticed to Samuel Cocker's firm of wire-drawers in Hathersage, Derbyshire. The ancient trade of wire-drawers converted cylindrical and flexible strands of metal into wire. To make wire, metal would be forcibly 'drawn' through a succession of holes in stone beads that gradually decreased the size of the diameter of the wire. Initially the flexible wire produced by wire-drawers were used in making jewelry. Fact 18: Who invented the Umbrella? Samuel Fox started his own wiredrawing business in Stocksbridge, Sheffield in 1845. The Telegraph had just been invented by Samuel Morse (1791 - 1872) in 1837 which enabled communication across wires and inventors were also experimenting with Electricity that also required the use of wire. Fact 19: Who invented the Umbrella? The wire-drawer Samuel Fox had chosen the right business to go into and aware of the advance of new technology he encouraged his workers to come up with new ideas. One of his employees, an engineer named Joseph Hayward invented a new hollow (‘U’-shaped), flexible wire. Fact 20: Who invented the Umbrella? Samuel Fox looked for ways to utilize the new wire, which led to his invention of the world's first successfully collapsible umbrella frame. Samuel Fox was not technically minded, nor had he trained as an engineer, but he was a practical person and a sharp businessman. He was aware that the umbrella was increasing in popularity but he was also aware that the umbrellas being manufactured at the time were either too cumbersome or too fragile. Fact 21: Who invented the Umbrella? Samuel Fox had found the perfect use for his new, flexible wire and in 1851 he invented the 'Fox Paragon Umbrella' which became an immediate success. "Fox's Paragon Umbrellas", with frames made out of his special new, strong lightweight wire, resulted in Samuel Fox becoming the largest umbrella frame manufacturer in the world. He also made a fortune out of using his lightweight wire for the manufacture of the hoops used to stiffen the fashionable crinoline skirts of the 1860's. Fact 22: Who invented the Umbrella? Samuel Fox died on 25 February 1887 but the history of the umbrella continued. In 1928 Hans Haupt invented the pocket umbrella. Later inventors developed umbrellas that could withstand storm winds and could not be turned inside out. The history of the umbrella is an interesting one, and what would we do in rainy climates without this ingenious object? Who Invented the Umbrella - Samuel Fox - Inventor - Invention - Definition - Meaning - Famous - Important - Umbrella History - Timeline - Innovation - Significant - Development - Clothing and Apparel - First - Definition - Kids - Facts - Information - Info - Who invented the Umbrella - Dates - When - Why - Impact - Purpose - Use - New - Old - Amazing - Best - Definition - Meaning - Awesome - Cool - Second US Industrial Revolution / Victorian Era (1850 - 1914) - English - Umbrella History - Timeline - Who Invented the Umbrella?